Lake Chalice: Macaroons or a Frontal Lobe? 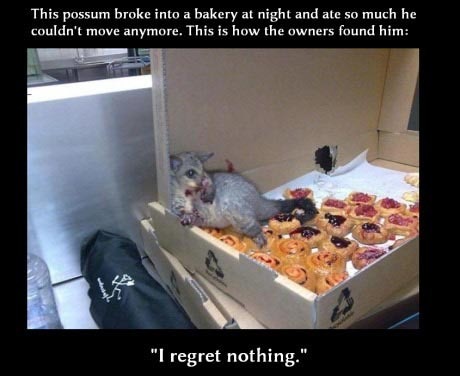 Unlike Mr. Possum, here, I'm betting you've got some self-restraint. You may think you don't have much, but as the animal kingdom goes, humans have a lot. Is that a good thing? Part of you, I imagine, would like to dispense with all that self-restraint and eat so much you couldn't move. This part of you imagines that, in defiance of your self-restraining part, you would "regret nothing." I haven't read a study on this, or seen any government statistics, so I'm just speculating here, but my guess is that over 90% of all dead Americans spent their entire lives and went to their graves without ever once eating pistachio macaroons in the bathtub while wearing a paper hat. What's up with that? That possum isn't wearing a paper hat because, well, he's a possum. Marsupials don't have such a refined aesthetic sensibility as you and I have. (And he's not in the bathtub because that's not where the food was. Duh.) 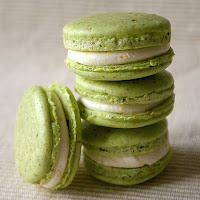 But he sure was into every pistachio macaroon -- and every other baked good -- he could find. Why would you work so hard for someone else -- even if this taskmaster will have the same name as you (and maybe even the same mortgage)? You’d have to have some kind of large growth on the front of your brain. Actually, you do. It's that frontal lobe. Our brains are a lot like other primate brains -- and even like marsupial brains -- in most regards. The biggest difference is that massive frontal lobe we got. This lobe pushed the low, sloping brows of our ancestors forward to become our sharp vertical brows. What does this frontal lobe do – besides keep our hats (paper and otherwise) on? The frontal lobe is where we create our future in our imaginations, allowing us to act today on behalf of someone else: the future self we will become. “the annual rate of inflation, the intellectual impact of postmodernism, the heat death of the universe, or Madonna's next hair color” (Gilbert 6). And the consequences of too many pistachio macaroons -- a thought which evidently never darkened the neurons of Mr. Possum. As a candidate running to unseat the incumbent of the last 2,000 millennia might ask: "Are you better off than you were two million years ago?" Would we be happier if we weren't so enslaved to our future selves and carpe diemed ourselves a few more paper hats? This is part 4 of 6 of "Happy." Next: Part 5: "Curse of the Frontal Lobe"
Previous: Part 3: "Reality vs. 'Should Be'"